Here’s a very nice presentation of a company’s logo using our aluminum hangers and Pos-Pro banner material. Pos-Pro is the same material we use on our retractable banner stands. The aluminum hangers give us a way to fixture it so that it stays flat. 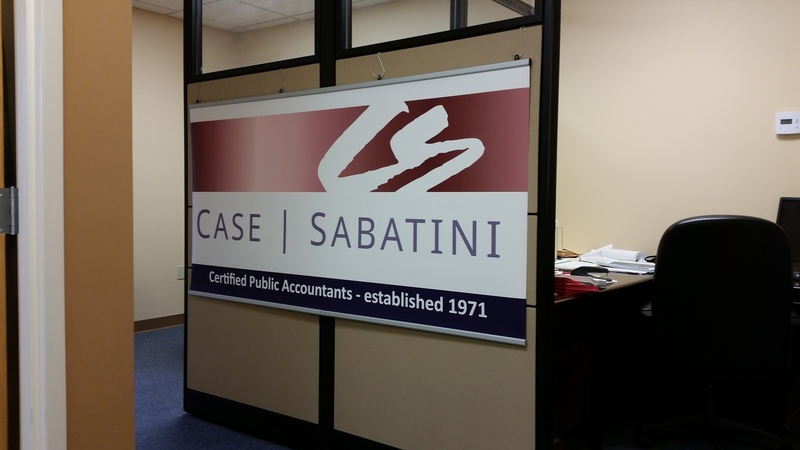 Our customer used the graphics in their trade show booth, and now they hang in their offices. They are accountants- and they are getting good value from the work we did for them! This entry was posted in trade show banners and tagged logo signs, office signage, trade show graphics. Bookmark the permalink.